Nintendo's top game designer has cooked up an unusual way to play Star Fox on the Wii U, and he's hoping you'll all be able to play it some time next year. Miyamoto revealed the new Star Fox game at the end of a Sunday evening showcase held in Nintendo's E3 booth for a handful of reporters. He also teased the game at the end of Tuesday's "Nintendo Digital Event." So what's Miyamoto's Star Fox? It's a game that uses the Wii U GamePad controller screen for a first-person cockpit view while displaying a third-person behind-the-Arwing-fighter view on the TV (the views can be swapped). The concept, Miyamoto explained, is to enable players to have independent control of where they fly and where they shoot. The GamePad's control sticks steer Fox's fighter jet, but the GamePad's gyro controls act more like a fighter pilot's targeting visor and let players tilt the pad to "look" in any direction to shoot. In practice, this means that the player will move wave the GamePad around to track targets if they so choose, instead of turning their Arwing to chase the targets down. "Before, in the N64 [game's] levels, when we had these valley modes, it was difficult to play those levels because the aiming was synced to the movement of the ship. So, as you were trying to aim, the movement of the ship was flying around within the valley. But now what we're able to do with the Wii U GamePad is, because the ship can move independently of your aiming, it makes it much more interesting and much more fun to play these valley modes where you're flying the ship but simultaneously aiming at a lot of different things in the level." Miyamoto's E3 demos are usually very polished, but the Starfox demo was aesthetically quite rough, sporting unvarnished art that was more functional than pretty. The cockpit view's displays for speed and altitude and even the lines defining the shape of the glass canopy were simple enough to look like "programmer art". Many of the game's audio clips appeared to be based on dialogue from Star Fox 64. "Open the wings!" "Check your g-defuser system!" Aesthetic improvements can come later. It first matters if a game is fun. With Miyamoto being just about the most respected game designer ever, that should be a safe bet, but my own first hands-on with the new Star Fox was a bit of a head-scratcher. It's not immediately clear how a Star Fox game benefits from two screens. I played three modes of Miyamoto's Starfox project to try to get a better understanding. The first mode involved simple arena combat: my Fox McCloud Arwing along with allies Slippy and Falco flying into a square-shaped arena level against dozens of enemy fighters and tanks. I could fly around, using most of the standard suite of Star Fox moves... lasers, lock-on bombs, loop-de-loops, u-turns and, of course, barrel rolls. I found myself mostly focusing on the GamePad screen. The first-person view and gyro controls made it easy for me to find and shoot down my enemies without looking at the TV. When I remembered to glance at the TV, I'd see my Arwing flying safely—too safely. The arena is a safe flying space. There was nothing for my Arwing to collide into. If I reached the mountainous boundary bordering the battle zone, my craft automatically turned around. If I pushed the GamePad's right stick in, the Arwing would transform into a tank. Same split view. Similar controls. But not much reason to get on the ground. The second mode I played was similar to the first but added Fox' nemesis Star Wolf for slightly more intense dogfighting. There were still dozens of enemies to fight but now I also had to deal with Wolf swooping in for the attack. Because Wolf would tail me, I finally did feel a need to glance up to the TV. When I did, I'd see if he was trailing me. If he was, I'd pull a loop, settle in behind him and then fire. As soon as I'd be behind him, I'd move my gaze back down to the GamePad, because its first-person view was best for shooting. The third mode I tried did the best job of justifying the split view. It was set in and above several square blocks of a city—possibly Kyoto, given the presence of Nintendo's headquarters building—at dusk. There was an invincible Godzilla-like monster walking the streets as well as some destructible quadruped robots. In this level, Fox flew a winged flying craft that behaved more like a helicopter with rotors in the wings allowing for hovering. Press the right stick in would cause the craft to drop a robot that could shoot or drive. The robot was tethered to Fox's ship. When I dropped the robot, my GamePad view would switch from the aircraft's cockpit to the robot's perspective. There were collectible tokens on the roofs of the buildings. I'd fly over a building, drop the robot and drive on the roof to the collectible. Because the robot was on a tether, I would have to glance up at the TV to get a sense of how much slack I had left or whether I'd have to nudge the aircraft over a bit to help my robot reach the collectible. I could also simply fly around while shooting from the robot's perspective. This was interesting more than it was fun, but it was also a good showcase for why it would be valuable to have two different screens to view. Several people who were demonstrating the Star Fox game asked me what I thought. I told all of them that I was unsure about the utility of looking at two screens. Miyamoto himself had said that "when you first start to play, your initial reaction is, 'Which screen should I be looking at it?' But once you get used to looking back and forth between the two, you very quickly get used to it and you begin to feel that you can't play without both screens." The Nintendo reps said the same thing. I have no reason to disbelieve them, but I do think I need to see this concept in levels that are built for it, levels where you fly, where you shoot, and where the ability to independently manage those two things is vital. In terms of a story for the game, Miyamoto said, "We're in an era when people have a limited amount of time… to play these long story-based games, so there will be a story for the game, but you'll be able to choose the missions you want to play." He said there will be arena-like missions and "valley" missions that sound like they're the conventional on-rails missions from the earliest game in the series. As early as Star Fox seems to be, Nintendo reps say the game is set to be released within a year. Miyamoto himself said that he thought development could go quickly. "The game started off as an experiment and what we're showing you here is in full development. We're planning to complete the game in a year." Confusingly, though, he also said that Nintendo is seeking development partners on it, making it sound like the game is far, far from done. "The way I design games is I start by experimenting with different aspects and play styles. Once we have that laid out and understood we go in and build the graphics [around it]." As the Sunday event wound down, I asked Miyamoto why he was showing the game in this state, far more raw than he usually shows games. "We've been working on a number of different games that use the GamePad as the focus of the gameplay. Among the games we were working on, this was one of them. But originally we weren't targeting E3 as the announcement time for the Star Fox game. But in developing it, we really came to like it and I also wanted to motivate ourselves to complete the game as quickly as possible. So we brought it here to E3 to announce it to give us that motivation." 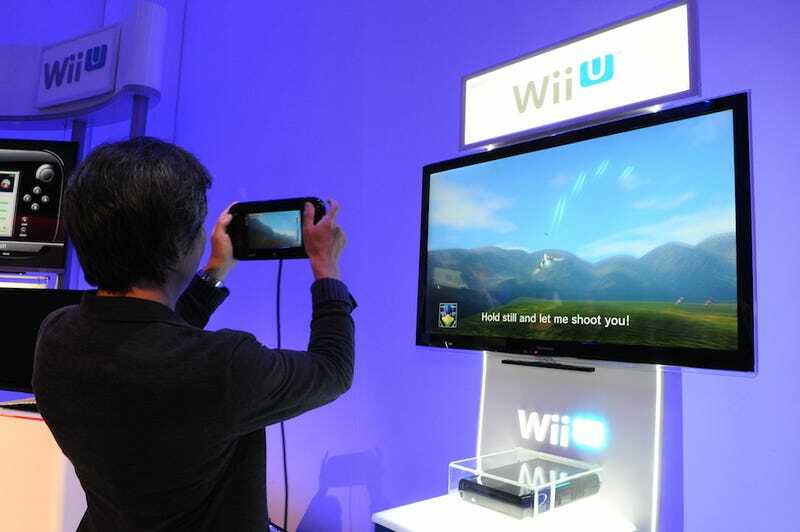 NOTE: Star Fox was just one of three Wii U experiments that Miyamoto showed on Sunday night. For details on the other two—one of which I loved instantly—please read this piece.